We’re making progress on the ‘new’ house! And I’m planning a big update post soon. But for those of you that missed our Facebook Live, I recorded a second house tour video in a horizontal format that’s easier to view on YouTube. Even if you saw our Facebook LIVE, you’ll see that we made some ‘progress’ (read: destruction) in the kitchen! 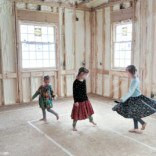 I’ve been making strides to make my favorite room in the house feel more like home so we have a space to hang out in that doesn’t feel like absolute chaos. 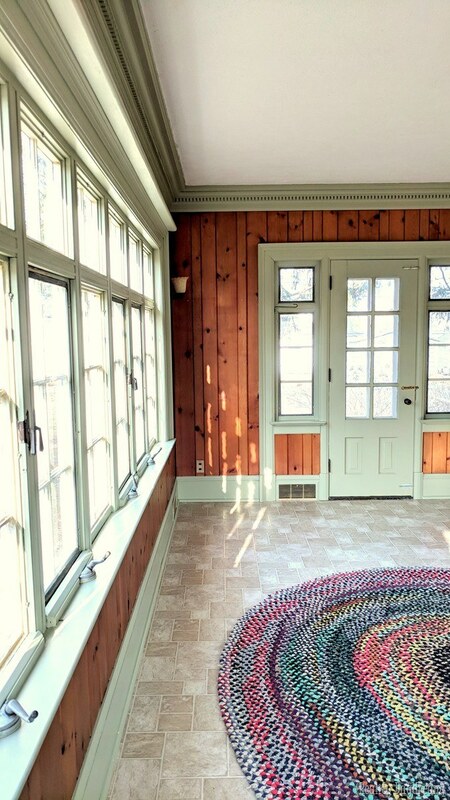 The sunroom, or as I lovingly call it, the ‘Solarium’, is coming along nicely! Even just painting all the trim made a huge difference. I found these amazing sconces to replace the ugly old ones. There was no electrical box behind them, so Nick had to do some Googling to make sure he would get it right and not hurt himself. I love how they look! I’ll have to get a pic of them in the room soon. But today I want to talk about a new sofa we got for this space! 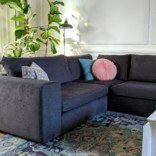 We’re low-key obsessed with Article furniture, and when they found out we were snooping their website for sofas, they wanted to partner with us! And then I died and went to heaven. 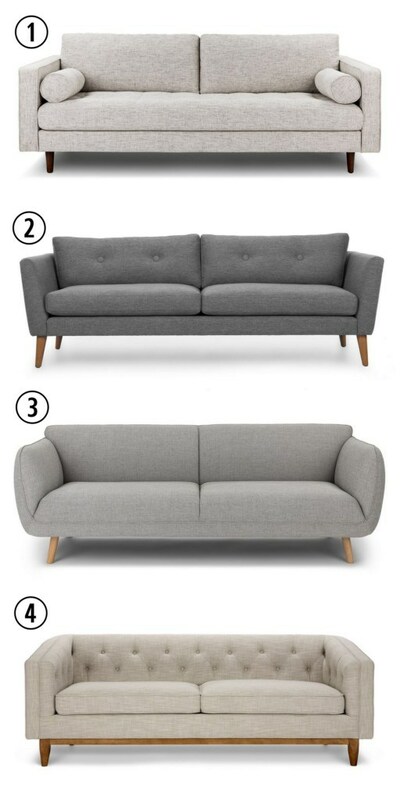 These are a few of the sofa’s I was eyeing and having trouble deciding between. Can you guess which one we chose? Before I spill the beans, I’ll have you know that for a hot second I considered this one, but I’m not quite sure I could pull it off or do it justice. But I still feel pretty spicy about the sofa that we did choose. We went with #3 …the Haro sofa in Vapor Gray. I love how it accomplishes looking both vintage and futuristic at the same time. While I almost always love the look of mid century furniture, sometimes the straight lines and sharp edges just don’t seem as inviting and cozy. And I love that the Haro is a bit of a curvy girl, but not too fussy. Sister doesn’t have any removable cushions or deep cracks to lose things. What you see is what you get. I also don’t hate the fact that Article offers a 30-day satisfaction guarantee so you can try things out in your new home without having to fully commit. Think of it as a grace period, or an exit strategy on a Tinder date. If you don’t fall in love, they’ll pick up the furniture and provide a refund! I, for one, am head over heals for this girl. For now I have her parked in front of these built-ins, but I’m still playing with different furniture layouts in my head. So stay tuned. The fabric is pulled tight and feels super durable, although we haven’t had it long enough to speak on it’s true durability. 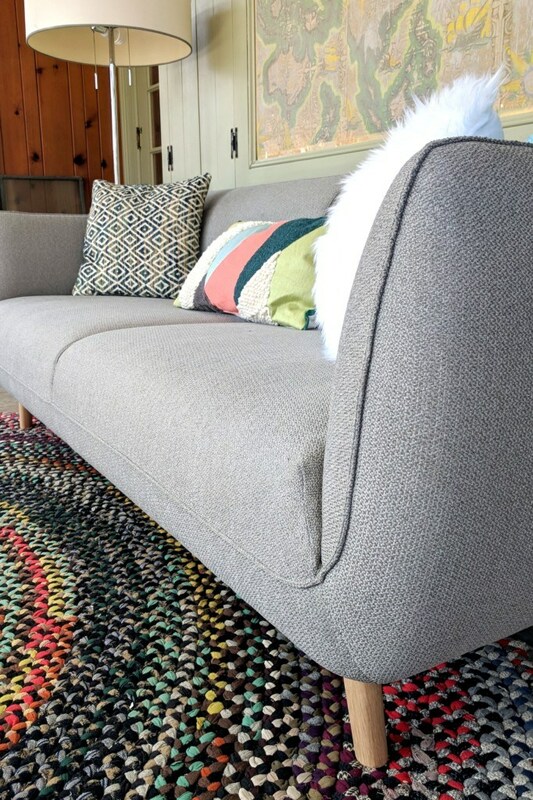 If you’re wanting a big fluffy couch that you sink into and feels like a big hug from granny, this isn’t your couch. But that’s one of the things I like about it most, because it won’t ever lose it’s shape or look frumpy from sagging cushions or stretched-out fabric. Not that that’s a metaphor for granny, because we love her softness, don’t we? I’m still not entirely sure where this girl will end up in our house, but we sure are enjoying her in the sunroom for now! It’s a welcomed vacation from the destruction going on in other parts of the house. If you follow me on Instagram and watch my Stories, then you know that I’ve cleared out this room and started painting the floor! I have some fun things up my sleeve, so don’t go anywhere! 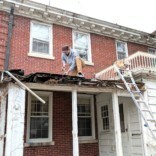 Fun things are happening at the new house! Thanks for following along on our messy journey! about this, like you wrote the book inn iit or something. Hi! I love this couch and am close to buying it. How has yours held up since you bought it? Has it kept its shape well? Still comfy? Anything sagging? Yes it’s held up nicely and still has it’s shape with zero saggyness! I will tell you though, it’s not a fluffy/cozy movie night couch if that’s what you’re looking for. It’s on the firmer side. 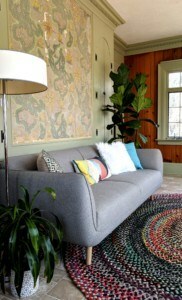 I like the couch, but I LOVE the rug. 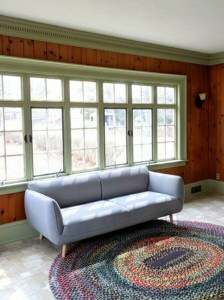 We’re redoing our living room, and I’m looking for one just like that! Where did you find it?!? I’m in love with the new house and I’m loving following along with all of the updates. The couch you picked looks great! May I suggest you get your couch treated for stain prevention? It’s well worth the money. I had mine done when my boys were little and they spilled orange pop, jam, etc, and it just wipes off. Even after years, and many washings, my couch was still stain proof. PS: is it Nick sizex??? That house is so gorgeous! Makes me want to call my realtor and tell her to keep us in mind for finds like this. A DIY girls heaven! Congratulations and I look forward to watching all the progress you guys make! OMG a couch with no removable cushions or cracks for kids to collect various crumbs, toys, popsicle sticks, etc?! Sounds like heaven! I’ll be shopping for new furniture for our new house later this summer. Thanks for the tip!